The LS3 robot, more popularly known by its earliest nickname, BigDog, is being retired. Despite hopes that it would one day work as a pack mule for US soldiers in the field, this dog had too much bark. Which is to say, it was simply too noisey. The earliest versions of this quadruped robot were first made by Boston Dynamics in 2008 and then under a $32 million contract from Darpa in 2010. By 2012 it was known as the AlphaDog, despite the fact that the name BigDog had stuck in the popular imagination. And its evolution was carefully tracked by robot enthusiasts around the world. But on the cusp of 2016, the US military is taking this dog behind the shed and putting it down. There’s no doubt that the thing sounded like a lawnmower, humming along as it skipped through the grass. But it was a rugged machine, able to carry 400 pounds, traverse uneven terrain, and take a kick—especially Spot, the smaller version that could carry less weight but was even more nimble than BigDog. It’s probably safe to say that BigDog and Spot’s legacies will live on in the countless robots yet to come. That’s just the way that robotics works; constantly building on the technology that came before. 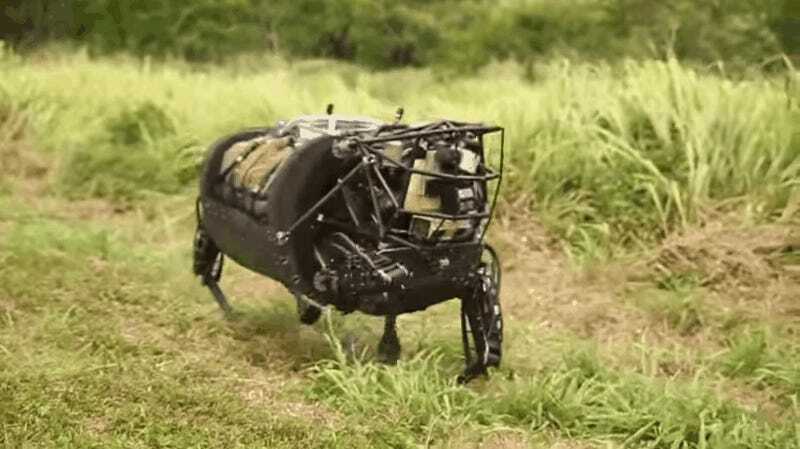 The LS3 may have been abandoned because engineers couldn’t properly tackle the noise problem, but the military learned quite a bit about quadruped robots along the way. We’re seeing similar evolutionary progress in humanoid robots in things like this past summer’s DARPA Robotics Challenge in Pomona, California. RIP BigDog, long live BigDog.